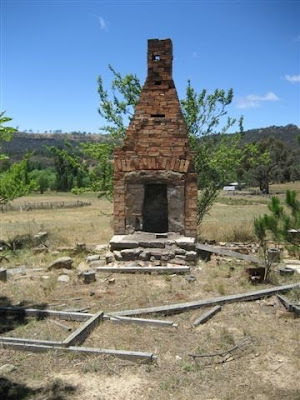 We enjoyed a terrific trip out to Ilford, Sofala, Orange and Mudgee, west of Sydney, recently. We wanted to see where our ancestors, the Readford and Aldridge families, lived in the early 1800s. The Readfords ran The Woolpack, an old coaching inn on the outskirts of Ilford, which is still standing. It's now called Old Westwood. The current owner says it's believed to be haunted - by a long-lost relative perhaps? Reading on Twitter about peoples' love of lone chimney stacks, I just had to include a picture of this lonely and forgotten chimney on the road to Ilford. I wonder if my ancestors ever sat around it with their friends, relaxing after a long day on the farm?